How many oranges?How much orange juice? Students make questions with how much / how many.They practise making sentences with there is / there are as well as some/any. They also revise the names of food and drink. 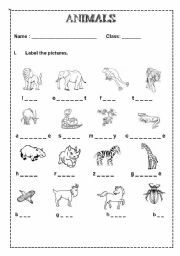 Various exercises useful to teach young learners about wild animals. Students revise the names of animals, food, body parts as well as activities.They also practise making positive and negative sentences with the verb ´be´,´can´, ´have got´. 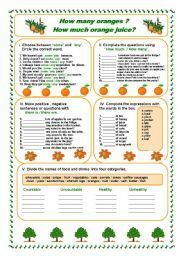 A worksheet useful to teach action verbs . 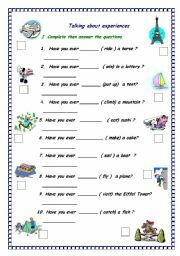 A worksheet useful to teach Present Perfect .Hope you like it! 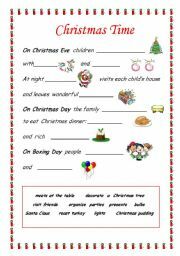 A worksheet useful to revise Christmas vocabulary and Present Simple Tense. 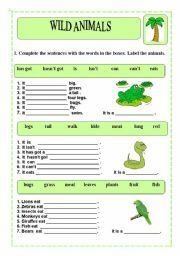 A WORKSHEET USEFUL TO REVISE THE NAMES OF ANIMALS. 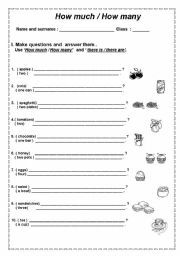 A good worksheet to practise making questions with ´how much´/ ´how many´.There are two pages. 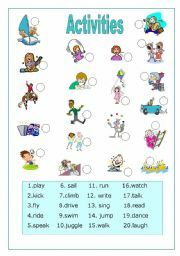 The exercises on the second page help students to revise vocabulary.Hope you like it! 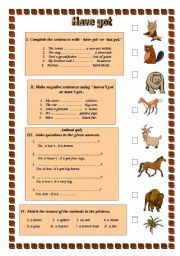 These exercises will help your students to revise the names of animals and body parts.Students can also practise making positive as well as negative sentences with the verb ´have got´. There is also a short animal quiz . 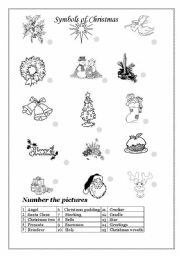 My students love guessing games!Have fun! A very good way to revise tenses. Students have to make positive, negative sentences and questions using Present Simple, Present Continuous and Past Simple. There are 10 pages! My students liked them very much!